I haven’t been in contact with you recently because I haven’t been well. I was put in our hospice for 3 weeks after i developed swollen legs and ankles with a very nasty rash on my right leg. Our hospice is combined with the hospital here and they performed some investigation procedures and they found I had small blood clots in the small veins in my legs. Things went from bad to worse in the ensuing days. I developed a chest infection and fever and lost quite a bit of my memory.I also lost my ability to swallow correctly and I could only move the food around in my mouth and could not talk properly. Visitors came and went but I don’t remember who or when. But gradually the intravenous antibiotics started to work and it all took a turn for the better. Only now I have lost the use of my feet, my toes curl up and they put me off balance. So now walking is impossible and i am beginning to understand how this disease works. It gives you a little bit of hope when things start going well and you feel like you are making progress, then the world comes tumbling down again and you have to start all your recovery over again. I was treated so well at the hospice that I know when the final stages of this disease takes hold that I will be very well looked after. So my treatment now is rest, very gentle physio exercises and nothing to over stimulate my brain because it just cant take it. You seem to be coping well with this disease and I hope you keep on doing so. Thanks so much for your email. I always look forward to getting news from you and to “comparing notes”! However, my writing is also slowing down considerably. It’s not just the physical act of typing, but also just remembering what used to be easy functions, such as capitalizing letters, copying etc etc. My brain seems to forget momentarily how to do these things. I spend more time fixing spelling, putting in words that I have omitted and making corrections than I do putting the original note together! It all used to be so easy and especially when I was able to do it with all ten fingers! I am now down to about four fingers that work! I also lose track of what I want to say and find that I don’t always finish off my thoughts. So I keep my notes for a while and fill in the gaps later! My eyes are also a problem, and I seem to be losing my depth of perdsepion (that was supposed to be perception!). I read that your two eyes see the picture differently because they aren’t placed in the same spot. There are brain cells that then take the two pictures and make them look like one – almost like focusing the two halves of a pair of binoculars in order to get one clear picture. In our case, withCBD, those cells that do the focusing have been affected by the disease. That’s why we have sight problems. Noise, even just normal sounds, drive me insane sometimes – whether it is just the wind, the vacuum cleaner, general conversation or really loud noises like dogs barking, shouting etc. I prefer to stay away from large groups of people now. My body is not aching but I have experienced some pain lately, which is a new thing. However, I do get extremely weary and have to sleep for longer and longer periods. I also get out of breath and have problems coughing and swallowing. My short term memory becomes increasingly affected and I have started doing strange things – like shopping and not knowing where I have left the goods, or standing in a queue at an ATM and then not knowing how to operate the machine! Life used to be so simple!!! I have passed your message on to Lance – thank you very much. The radio programme keeps me going, but I must admit that sometimes I feel like it’s time to stop. However, there are so many people who listen and I don’t want to disappoint them. It also gives me purpose each week and something to look forward to. The last month especially has been very difficult for me, both physically and emotionally. But I am determined to pick up the pieces and start again. In two weeks time, the musical Oklahoma is being produced here in Port Elizabeth and the proceeds from the premiere will be donated into my children’s’ trust fund. I worry about the future costs associated with my medical situation and of course their education. I studied inOklahoma(“Red Man”), and was made an honorary citizen of the State, so the show has a very deep personal meaning for me. One of the songs from the show, OKLAHOMA OK, is the state song, so we used to sing it often at school and sporting occasions! Other than that, I have to slow down considerably. I find it difficult passing my days and not being able to do something constructive. I have also stopped driving (but have cheated once or twice!!) and that has been very difficult for me. It takes away your independence. Give my regards to John. I have forgotten in which city you live!! Love and best wishes. Live strong! I am sorry I haven’t emailed you for a while, but my health hasn’t been the best and sitting down and typing was very hard and I admire you so much to be able to do it week after week and sometimes more. I have been having trouble with my eyes, they don’t seem to able to cope with daily life, such as reading, writing, watching television or just watching general movement of people. I have to wear an eye mask most of the day. My ears are not coping with any noise. I find it better wearing earplugs, to dull the noise. So listening to the radio, which was the only thing I was enjoying, is now gone. My doctor said my brain wasn’t coping with all the stimulation of the noise and sights. So now I have to try and block most things out. My body aches continually, and I get so out of breath and as much as I want to keep denying these things are happening, they are gradually wearing me down. A couple of weeks ago I couldn’t keep my eyes open at all. So now with wearing my eye mask it has allowed me to keep my eyes open a few hours a day, and now this is all I can manage to type, because the weariness just overcomes me. Anyway keep up the good work that you do for as long as you can. My husband reads me your postings, we look forward to them and your radio segments and please convey our condolences to Lance on the passing of his father. 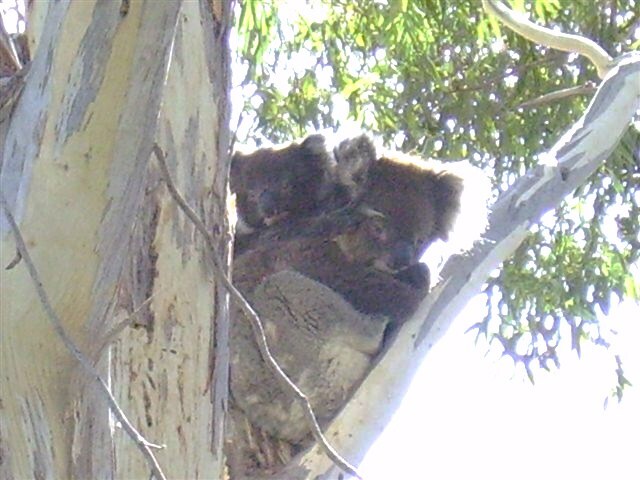 I just had to show you these two darling koalas my sister found in her backyard tree. They were gone the next day but it reminds us how lucky we are to have such beautiful wildlife in our area. Thank you for remembering that I had contacted you a few months ago. ( I had actually forgotten, which isn’t unusual for me these days ) and I would like to thank you for putting the ALS video on your blog site. There are so many neurological diseases and for each one that is highlighted it is a reminder that we are not alone, isolated yes, but not alone. Thank goodness for the internet, because it allows us an insight into the many problems each of our families and ourselves have to endure. I’m glad you mentioned the Baclofen medication and the problems it caused you, I found I could not take Levodopa (which is sometimes recommended for us) I only took one and I was awake for 40 hours straight. Definitely not good for someone who needs their sleep. So it goes to show that we are all individuals, and one medication is not suitable for us all. As for me, I had a terrible week last week. I had, what I would call an episode, during which I lost most of my motor functions again. I couldn’t keep my eyes open, hold a spoon, find my mouth or walk more than a couple of steps and my speech was slurred and I thought this is it, the beginning of the end, but a couple of days later I started to get my motor functions back and while I am still a bit wobbly and my speech is not the best I am getting back to where I was before. I feel now I am beginning to understand my body and what is happening, although I would like to know how fast this disease progresses. I’m glad you are looking at a wheelchair. It certainly is a mental thing to get used to having to have one, but it has helped me immensely and if you learn to use it now, while you still have a lot of your cognitive abilities, then its easier to manoeuvre when you need it, ( and its definitely not as easy as it looks ). I left it a bit to late to learn how to use mine, I get confused and its easier to just let my husband push me. Thank you for sending me the links to your radio programmes, my physiologist listened to them and she was very impressed, especially with how much its able to help me. We were able to get your radio programme last week, the wireless connection actually worked. Its on at 7 p.m. here. Its wonderful to think we are so far away from you but we are able to listen in real time and Lance is wonderful to allow time on his programme to help bring awareness to this horrible disease. And as for you Ed, keep up your wonderful work. I can imagine how hard it would be at times, but your a wonderful inspiration to us all. If you are wondering what was happening with my last email, I pressed the send button instead of the save to drafts button. Sometimes as you know we get jerky fingers and mine jerked at the wrong time. What I was trying to say was I understand the stress of getting the news of your condition via a sketch or just given a name like CBGD. If I could do anything Ed, it would be that anyone diagnosed with a terminal illness could be given as much information as possible and given support as soon as possible without that terrible wait where you are on your own with that awful news. Because like me you were possibly trying to explain it to your family by just having the information you gained from the internet. As I wrote before my neurologist gave me a computer printout containing medical terms that I couldn’t understand and we had to go home and look them up on the internet so we could thoroughly understand what was happening to me. I was interested to hear about your medication. Isn’t it strange how everyone reacts differently to the medication we are getting. I found that the Baclofen has really helped with my muscle spams, but if I remember correctly it took me a couple of weeks to get used to it and for it to start to work properly. I have gone to your web page and its looking very good. I feel that it will help a lot of people, and anything that gives people an insight into the various brain malfunctions is a wonderful idea. My palliative care physiologist came for a visit today and she listened to your radio programme where you mentioned me and she was very pleased that I helped you and that you were helping me with dealing with this disease. She said to say hello to you and said she was very glad again that she had read your Heathrow article. Sorry to hear about your wiring problems on your blog. You explained that so well. I admire you so much for being able to communicate so well. Its very confronting to see your medical problems in print but what you do is so helpful to people like me, suffering this horrible problem and also for the general public, who really don’t understand what CBGD is. My husband thought your blog was very helpful and we both had a laugh at the end of your article. I, too have had an awful week. We have had so much humidity here this week, and I suffer horribly in the humidity. I feel like I have a muscle and brain meltdown. Nothing works together. I have to have the air conditioner on all the time to make me feel a little better. I hope my last email wasn’t too confronting for you and your readers. I tend to forget that some people have different views regarding end of life issues and I would hate to think that I caused you or your family any distress. My husband took awhile to accept my decisions, but he has accepted them now and I know he will not go against my wishes and even he was the one who suggested that I donate my brain for medical research after death. So we researched that together and made all the arrangements and I feel so much better knowing that I have done something to help other people with this disease and also because my Mother died from the same symptoms as I have now. She was diagnosed with Miniers disease when she was in her fifties and had regular bouts of dizziness and nausea. It wasn’t until she was 75 that they realized she was having seizures and it wasn’t Miniers disease, by then she was also diagnosed with dementia and a few weeks before her death, her right arm was wandering up and down, she couldn’t talk, walk or swallow. So, I believe she had the same symptoms as I have but she wasn’t diagnosed properly. She didn’t have an autopsy. I wish she had, it would have answered a lot of questions. So that is why I had my DNA taken, so the family can keep track if any more of us come down with similar symptoms. They did find an variant of uncertain significance in the PGRN gene. They were only checking for frontotemporal dementia and it should become clearer in the next few years whether this is related. Although you don’t seem to have dementia because you write and speak so well. Do you any have cognitive problems? I hope you are one of the lucky ones to escape that part of this disease. I wish you well Ed, and I hope the doctors have helped you with your medication. Look after yourself and try not to get too hot or too tired.